Brenna and I were SO EXCITED. 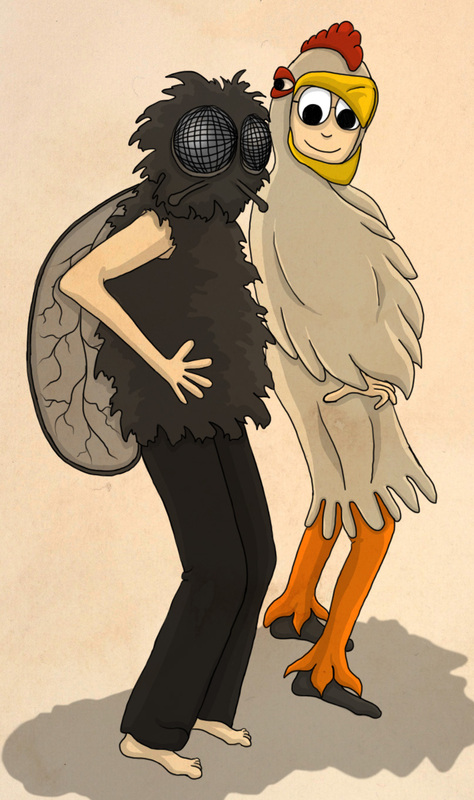 I was going to be the fly and she would be the chicken. She took one look at the chicken suit and demanded to be the fly. I thought being a chicken would be HILARIOUS plus I was psyched about being able to breathe so I went for it. Best costumes EVER. AND ALSO THE WORST. The kids loved them, and we (I) had so much fun jumping around and clucking and pecking at people and inanimate objects. Pictures of me as a chicken have haunted me ever since. I will post the actual picture of me as a chicken on my Facebook Page on Halloween. Here is a link to last year's Halloween post where Brenna and I dressed up as Grannies for a party we didn't realize was space themed. Haha. Oops! Today is also Brenna's Birthday! Happy Birthday, Brenna!